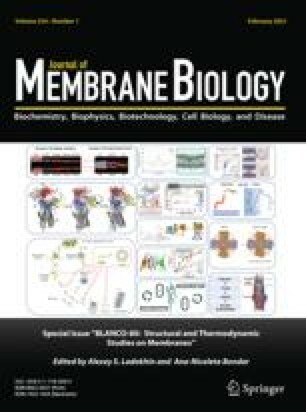 Methods have been used for monitoring either volume flows or pressure changes, simultaneously with membrane potentials, in giant algal cells ofChara australis during an action potential. The volume flows were measured from the movement of a mercury bead in a capillary tube recorded by a photo-transducer. The pressure changes were measured by monitoring the deflection of a thin wedge, resting transversely across a cell, and using the same photo-transducer, the deflection of the wedge being directly related to the cell's turgor pressure. The average maximum rate of volume flow per unit area during an action potential was 0.88±0.11 nliter·sec−1·cm−2 in the direction of an outflow from the cell (total volume outflow being about 3 nliter·cm−2 per action potential). Similarly, the maximum rate of change of pressure was 19.6±3.8×10−3 atm·sec−1 (peak change being 19.3±2.9×10−3 atm equivalent to 14.7±2.2 mm Hg). The volume flow and pressure changes followed the vacuolar potential quite closely, the peak rate of volume flow lagging behind the peak of the action potential by 0.17±0.08 sec and the peak rate of pressure change leading it by 0.09±0.07 sec.